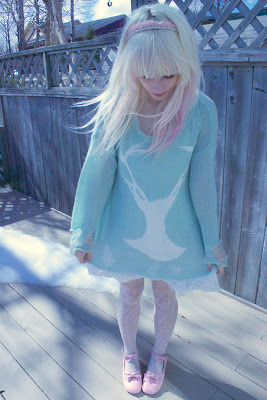 so spring is officially here~ after some very up and down weather, the snow is finally melting. it's sunny, but still rather cold, so it's essentially our spring! 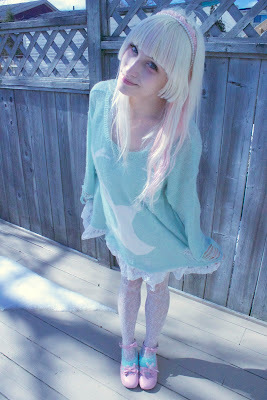 it seems more acceptable to wear pastels now and i'm a little jealous~ i wear pastels and lace all year round! get your own fashion identifier! blah~ can't wait for the pastel trend to pass again into the next obnoxious thing so that people who are not comfortable in themselves and just follow whatever is out there will move on. this week is my last week of classes, so come saturday, april thirteenth, i will be done my first year of university! i'm really excited because then i can start changing around my room and repainting it! i'm doing a huge overhaul of my life for several reasons and i feel like it's time to settle into a better environment. if it's one thing i don't mind speaking about, it's my anxiety. the reason i do not blog or go out as much as many do, is because most of the time i'm inhibited and am confined to my room because most days are very bad days. so i figure redoing my room is a way of making my home feel more like my home since i spend most of my time there! i've gotten new sheets, bedding, curtains and some paint. all i need are some furniture pieces and then i can start selling old clothes and accessories and furniture pieces to repaint my room, move things around and welcome in new surroundings! i have a 'blueprint' all done up, it's just a matter of putting it in action. so come april thirteenth, i'll be able to start that! eep! really? ♡ thank you so so much! you're so precious, ahhh. thank you thank you!